Hippo Video is an online screen and video recording service which helps you create and add videos to your Freshdesk tickets. All Freshdesk users get Hippo Video free for 90 days (Total Value = $570). Contact support@hippovideo.io to activate. Hippo Video is an online video recording tool which helps you create and add videos to your Freshdesk tickets. It helps you create quick demos, how-to videos, customer testimonials and gives customers the facility to record issues through videos. 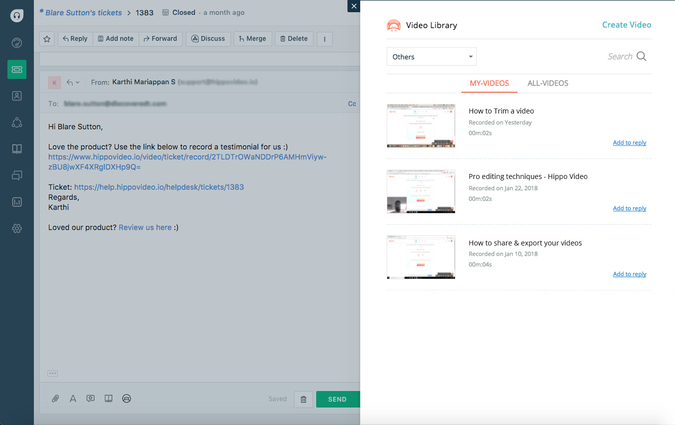 Bring in the power of videos into your Freshdesk account with Hippo Video. Hippo Video is an online video tool designed to quickly create video content. It integrates closely with Freshdesk to your help support team create videos to address customer issues. 1. Ticket resolution - Capture the steps to resolve a problem as a video rather than explaining it over an email and share it with your customers. 2. How-To videos - Create tutorials and post it on your knowledge base. Enable your customers to help themselves with these videos. 3. Video Tickets - Give the power of video to your customers by letting them record issues through videos. The recorded issues comes directly into the agents account. 4. Easy sharing - You can share the created videos as URL, embed in your knowledge base articles, send as email and share in social media. 5. Enhance customer relationships - Video is a great way to build relationships. Engage your customers with real-time videos. 6. Create customer testimonial videos - Nothing sells a product like a good customer testimonial. Let your customers share their journey in a more engaging and relatable way with videos. Simply share a link with your customers and let them record their testimonial through that link. Getting started is simple. 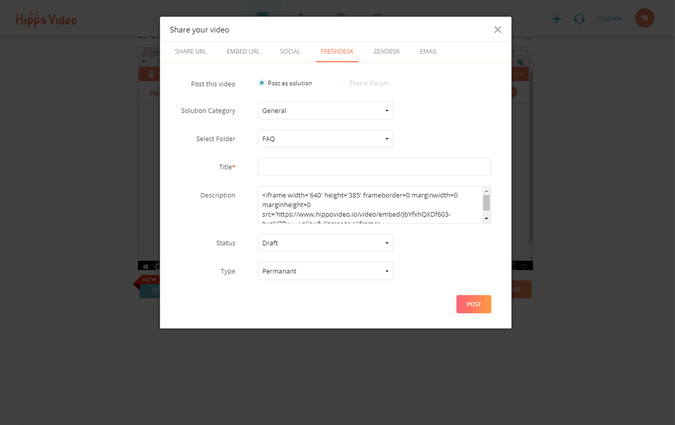 Click install and you can start crafting videos with Hippo Video. Setting up Hippo Video app for Freshdesk is just a 2 second work. 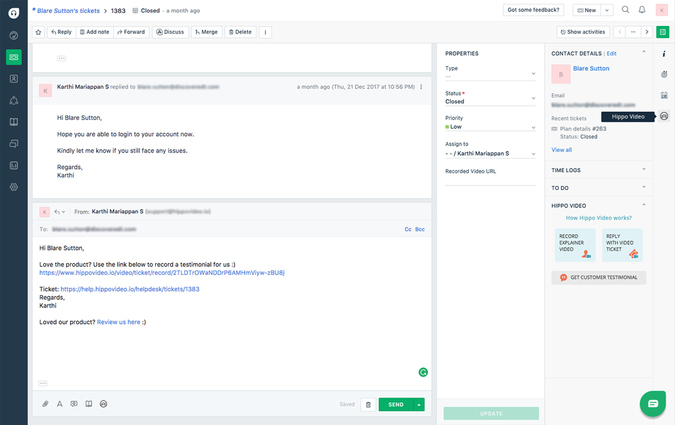 Once you are done installing Hippo Video, you just need to provide your Freshdesk API Key and Admin Email of your Freshdesk account to get started. 3. In the next field, enter your Freshdesk Admin Email address. Once you are done with this process, you will automatically be signed up with Hippo Video. You will receive an email with your Hippo Video login credentials.